"...This truly is an all-ages show: kids as young as three or four, I will wager, will be entranced by what they see, and the running time won�t tax their attention span. On the other hand, adults won�t ever feel like they�ve been misdirected to something for children � you can enjoy the work without whatever baggage you happen to bring with you inside the theater." "...There�s no dialogue in the spectacle conceived and directed by Zimmerman and featuring a five-person cast, an ingenious array of puppets and an exquisitely capable woodwinds/cello/violin/piano quartet. There�s no dialogue needed. The ensemble creates an entire household of memorably bratty children, put-upon parents, idiosyncratic toys and subterranean creatures." "...Famously, Andersen's stories don't shy away from the cruelty in humanity, and that gives the sacrifice and love and beauty they mine out of it and showcase more meaning. Zimmerman's adaptation is full of so many brain-tickling visual and emotional contradictions and bits of pure magic than I'm not ashamed to say that I was a blubbering mess by the end of it, my heart full of hope and gratitude. What an absolute gift this Tin Soldier is." "...Todd Rosenthal�s set for The Steadfast Tin Soldier resembles an extravagantly wrapped Christmas present. Delicately placed inside the Lookingglass space, it�s a person-sized toy theatre, framed by a festive miniature proscenium and sporting an advent calendar in place of a curtain. (There�s even a small orchestra pit.) It�s the kind of gorgeous creation that, in lesser hands, might come across as fussy: meticulousness for its own sake. In the masterful grasp of Mary Zimmerman, however, it�s a yuletide delight: a gift so beautiful, you�d almost hate to open it." "...This �soldier� is well worth saluting: There�s an enchanting Christmas Pantomime on Michigan Avenue � Lookingglass Theatre Company�s jewel-box of a holiday divertissement. Transformed by music, dance and spectacle more than by words and lyrics, The Steadfast Tin Soldier, Hans Christian Andersen�s fairy tale from 1838, is the perfect recipient for director Mary Zimmerman�s multifaceted magic. We�re treated to pretty and playful processions, whiplash alterations in scale and size, and an ever-ornamentalizing imagination that sees consummate textures, patterns, and resonances in everything on stage. Zimmerman�s open-eyed dreams are always deliciously detailed." "...Let's Play �Highly Recommends' seeing The Steadfast Tin Soldier at The Lookingglass Theatre. It's a wonderful way to enjoy the holiday season and a nice break away from all of the crowds that are sure to patronize the Magnificent Mile. You will be thankful you did!" "...The holiday season is filled with wonderful stories. For eons, we have been viewing new interpretations of � Christmas Carol�, �It�s A Wonderful Life� and of course, �The Nutcracker�. It is a part of the season. Each year I look forward to something new coming our way, and thanks to Lookingglass Theatre and Ensemble Member Mary Zimmerman, this year we ar etreated to just that. �The Steadfast Tin Soldier� is based on a story by one of my favorites when it comes to fables, Hans Christian Andersen." "...The holiday season in Chicago is upon us and with it comes many a theatrical tradition: a �Christmas Carol� here, a �Nutcracker� there, some �It�s a Wonderful Life� mixed in, too, plus a �Burning Bluebeard� for good measure. Lookingglass Theatre Company throws their hat into the ring with �The Steadfast Tin Soldier,� a world-premiere adaptation of the Hans Christian Andersen tale, conceived and directed by Mary Zimmerman. It is a worthy addition." "...Adding immensely to the production are the bewigged musicians who are playfully engaged in their little orchestra pit beneath the stage. They include Leandro Lopez Varady (pianist, music director and arranger), Greg Hirte (violin), Michal Palzewicz (cello) and Constance Volk (woodwinds). And they are there to accompany the show�s musical epilogue as the actors join for a bit of heartfelt restorative advice in a song that pays homage to a steadfastness of spirit." "...Lookingglass Theatre never fails to enchant, mystify and, while impressing its audience, always manages to teach a subtle lesson, or two. All of this while providing some of the most memorable productions in Chicago. This world premiere 60-minute play is no exception. Mary Zimmerman�s stylish family entertainment has been written with an attention to detail and directed with additional flair and finesse. The cast, the musicians and the brilliant technical support are all first-rate and offer Chicago one more extraordinary entertainment choice for the holidays." "...The five actors are all outstanding, but they get plenty of assistance from the designer brain trust consisting of Todd Rosenthal (scenic design), Ana Kuzmanic (costume design), TJ Gerckens (lighting design), and Andrew Pluess and Christopher LaPorte (sound design and original music)." 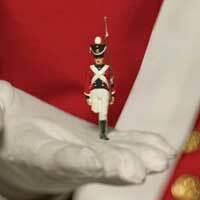 "...I loved THE STEADFAST TIN SOLDIER hard! It was beautiful and timely! At the very end, Foster led the ensemble in singing about being steadfast in times of adversity. The message was some people are mean but we don�t have to join them. Instead, we can be steadfast. The show is breathtakingly gorgeous!!" "...Mary Zimmerman's The Steadfast Tin Soldier is the theatrical equivalent of a gift under the tree on Christmas morning; it's warm, heartfelt, and wrapped nicely in a bright holiday bow. The puppetry and theatrical invention is beautifully rendered, and the performers are generous and perfectly in tune with the sensibilities of this material. It's true holiday escapism, and a home run for Lookingglass Theatre Company's brand of classic spectacle." "...This production may be designed for the holidays but it really is a play to marvel at and appreciate any time of year." "...There is simply no reason not to see The Steadfast Tin Soldier. The show leaps into my list of best plays of the year, and at only an hour long it won�t eat up much of your evening. Children below five might be a bit frightened by some of the elements, but otherwise this is a beautiful, brilliantly-realized play for all ages. If I still gave stars, it would easily get four of them; Zimmerman has once again hit a home run for Lookingglass. It is the perfect play for the season."